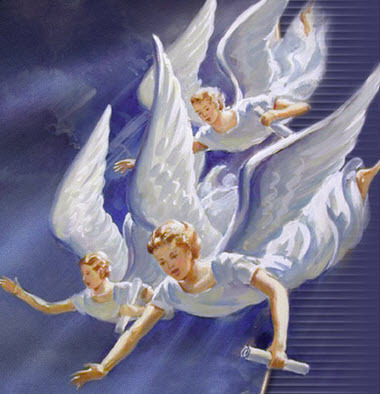 Through out the Scriptures we see that the Lord has used angels often for either communications, good deeds or swift retributions. They are indeed active in the great redemption plan of God. This week we’ll look at some of their actions in the past and make a greater point as to how some of God’s S.D.A leaders are mincing, chopping and trying to make of no effect a plain “Thus sayeth the Lord” Word. “Yea, whiles I was speaking in prayer, even the man Gabriel, whom I had seen in the vision at the beginning, being caused to fly swiftly, touched me about the time of the evening oblation.And he informed me, and talked with me, and said, O Daniel, I am now come forth to give thee skill and understanding….And, behold, an hand touched me, which set me upon my knees and upon the palms of my hands. And he said unto me, O Daniel, a man greatly beloved, understand the words that I speak unto thee, and stand upright: for unto thee am I now sent. And when he had spoken this word unto me, I stood trembling. One would think that the above is clear , to the point and not at all misunderstood, right? Not so fast. Recently we were involved in a Facebook public chat with brother H, (alias). The subject came about because another brother made a post asking for any help in receiving a report on the church history of abominations. In other words, he wanted to know what past historical acts of church leadership was known as truly wrong in God’s eyes by Scriptural standards. “Angels are sent from the heavenly courts, NOT TO DESTROY, but to watch over imperiled souls, to save the lost, to bring the straying ones back to the fold. ‘ I came not to condemn, but to save.’ Christ declared (RH May 10, 1906, par.15) See also GC 36.1. Huh?? This seemed much gobble gook and I knew we’d have to look into this further to decipher his meaning, which the Spirit told me was very misconstrued. Now, it would be one thing if there were not many other brethren following this conversation, such as a one on one email chat or study. I would not have had such desire to help him see his error due to the fact that he is the author of three books on the “Three Angels’ messages.” In other words his is full of himself and has no need of any contrary points of view, but because there may be others who can benefit from this conversation, I took upon it a more serious attitude. “The truths most plainly revealed in the Bible have been involved in doubt and darkness by learned men, who, with a pretense of great wisdom, teach that the Scriptures have a mystical, a secret, spiritual meaning not apparent in the language employed. These men are false teachers. It was to (p.599) such a class that Jesus declared: “Ye know not the Scriptures, neither the power of God.” Mark 12:24. It was clear that this gobble gook was a disguise of the plain simple “thus sayeth the Lord”. Yet even though I knew this, others were watching and should be shown the false path of interpretation this brother was trying to lead them, in a comprehensive way because we are dealing with a self proclaimed scholar. Our proof case would be 2 Kings 19:35. Before we go into it, we want to explain that the reason this exposure of false teaching is important is because he really is attempting to deny the Lord’s power and His rightful execution of judgments. After all these are for our admonition , our benefit in knowing we serve a loving yet honest and holy God. His will and judgments are RIGHT even when some call them “uncalled for, extreme, just for the Old Testament, etc.” Or in the case of brother H –substitution of meaning and not employed by the plain word of God. Brother H sent us a report showing that God NEVER has angels do any destroying, rather it is the evil angels who do the killing or hurting, upon God’s withdrawal of protective angels. He used several SOP quotes and sounds all nice and cozy but is it true, does God allow Satan and his angels to do His justice and retributions? Sounds quite far fetched even at first glance! Here we see that brother H wrongly attributes the Destroyer of Rev. 9:11 to Satan, as even most protestants do. Ok let’s examine our test case. So we want to zero in on “angel”, what does H4397 mean in Scripture? A literal angel, or a figurative one? A heavenly messenger of God? Just what is that meaning? H4397 — mal-awk’; from an unused root meaning to dispatch as a deputy; a messenger; specifically, of God, i.e. an angel (also a prophet, priest or teacher):—ambassador, angel, king, messenger. So adding it all up we see that H4397 does indeed mean literal angel (111 times). We see that it could be a messenger (98 times) (ie. King, prophet, etc.) but in this case no one human could go through an army in one night and kill 185,000 men! Logical deduction proves it an angel of God. Next we want to see “smote” H5221. Could that be a pestilence as brother H says? H5221 — naw-kaw’; a primitive root; to strike (lightly or severely, literally or figuratively):—beat, cast forth, clap, give (wounds), × go forward, × indeed, kill, make (slaughter), murderer, punish, slaughter, slay(-er, -ing), smite(-r, -ing), strike, be stricken, (give) stripes, × surely, wound. strike (2x), stripes (2x), miscellaneous (13x). In looking at the vast amount of times H5221 is used either to smite or slay, it is clear that because the army men were struck by the angel H4397, they were killed directly by that angel. To wind it up H4191 confirms being dead. kill (31x), dead man (3x), dead body (2x), in no wise (2x), miscellaneous (10x). We have solid proof that the words of 2 Kings 19:35 can mean only what they literally say. This is God’s intent that we trust and believe the clear “thus sayeth the Lord” , not thus sayeth man who uses vain imaginations to thwart God’s word. So to use brother H’s reasoning we must cross out H4397 (angel) insert one of “variant” meaning, which is only used 4 times in Scripture versus 111 times for literal angels. Then we must cross out H5221 (smite-kill used 440 times) for the use of “pestilence” which isn’t even listed as a meaning of that word. Lastly to confirm the Lord’s plain Scripture and His angel’s faithful obedience the word “dead” is confirmed (H4191). By way of disclosure this brother knows about the Lord’s Rod and flatly rejects it. Is there any more evidence needed to see that the Spirit of Truth is NOT leading? Sadly this kind of falsifying God’s word is rampant through out our people, it’s time to wake up and know His word properly and clearly –as it reads. Time is short and we must be on guard for all of Satan’s trickery. God DOES use angels both for uplifting man and for swift retribution. May His will be done and His kingdom come. And when it is time for that kingdom, there shall indeed be very active work done by His angels, both uplifting and swift retribution. This entry was posted on February 9, 2019 at 5:44 am and is filed under Delusion, Proper teachings, The Spirit of truth, Truth telling vs. lying. You can follow any responses to this entry through the RSS 2.0 feed. You can leave a response, or trackback from your own site. Truly there is nothing to fear except as we forget the past and how God has led us.This was a very arousing message!